This month's challenge is brought to us by the adventurous Hilda from Saffron and Blueberry and Marion from Il en Faut Peu Pour Etre Heureux. They have chosen a French Yule Log by Flore from Florilège Gourmand! What is a French Yule Log? According to our hostesses, you can buy two kinds of Yule log in France, the Genoise or Buttercream type. However, what is more commonly purchased is a frozen Yule Log very reminiscent of an ice cream cake, only often it’s not made of ice cream but rather frozen mousse of some sort. In French this is called an entremets which is sometime loosely translated in English as simply as a cream dessert. This also means that this recipe is not holiday specific - it is just a scrumptious dessert recipe that you can enjoy year round! The recipes of most elements come almost entirely from Florilège Gourmand, which belongs to Flore, except for one small labeled portion and some of the variations courtesy of our dear Daring Baker fairy Tartelette. 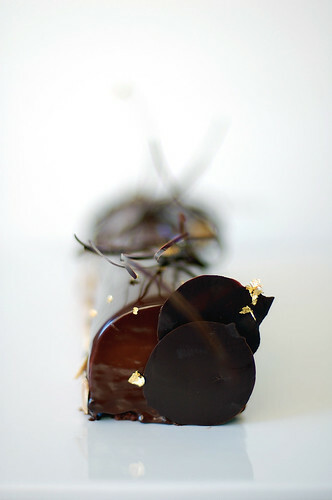 Different recipes have been pulled from the entremet section of Flore’s site to make up this masterpiece. Also, since Flore’s blog is written in French, hugs to the hostesses for the translation! Thank you ladies for choosing this beautiful and absolutely scrumptious dessert! Before we begin, I just want to let you know that this may look impossible to complete but I assure you that this looks 100 times harder than it really is! The key to success is organization! As long as you complete each element in the order that it calls for, you are half way there, what is left is how to assemble and to decorate. On top of this, I strongly advise you to break the elements into 2 days so you have enough time to draft up the final look of this dessert. You see, I bake the crème brûlée and make the chocolate praline crisp the night before and let them set in the refrigerator. 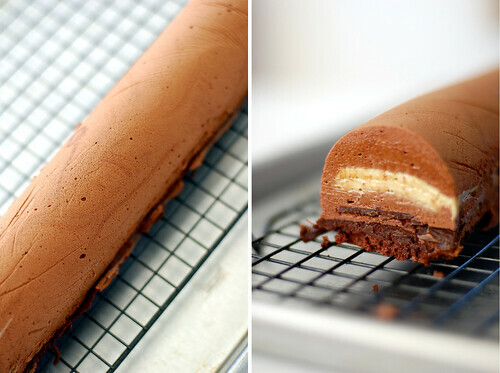 Bake the dacquoise biscuit the next morning, while it is being cool, I whipped up the mousse. Assemble these elements and let set in the fridge. 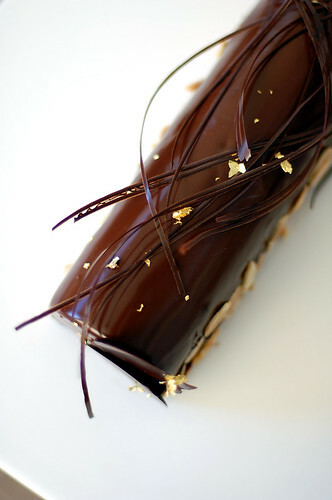 Meanwhile, make the ganache and complete the log composition. Later in the afternoon, demold and cover the log with glaze to complete it. Decorate it an hour before serving. - You are of course free to flavor your layers differently, we realize not everyone likes chocolate; it was just the simplest way to introduce variations. You will notice there are fruit variations in a couple of the components, you may of course do fruit flavoring for all of them, but we can’t guarantee we know exactly how to change the recipe in that case, so bear with us and we’ll try to help you out as much as possible. - PLEASE READ THE NOTES AT THE BEGINNING OF EVERY SECTION. They should help you with most questions you may have, at least we hope. - Please look at the pictures of the “new” components in this recipe that you may never have seen before and at a completed log courtesy of Marion running a test at the very end of the recipe. - We’ve tried to give you as many measuring units as possible (this recipe started out in grams only). We hope this helps. Imperial units (tbsp etc…) are American. - For all our alternative bakers, the recipe is so long we didn’t know where to start even asking Nathalie to do a gluten-free one, so please feel free to ask, we’ll do our best to help you. 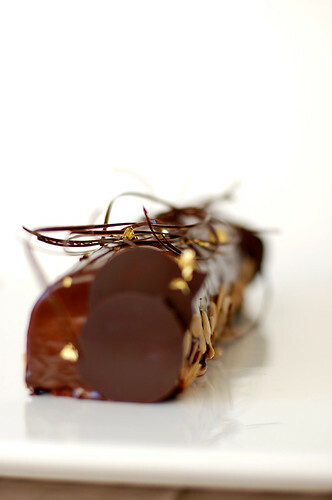 Note: Feuillete means layered (as in with leaves) so a Praline Feuillete is a Praline version of a delicate crisp. There are non-praline variations below. The crunch in this crisp comes from an ingredient which is called gavottes in French. Gavottes are lace-thin crepes. To our knowledge they are not available outside of France, so you have the option of making your own using the recipe below or you can simply substitute rice krispies or corn flakes or Special K for them. If you want to make your own praline, please click here. 1. Heat the milk, cream, and jasmine tea leave to just boiling. Remove from the heat and let the jasmine infuse for about 12 minutes. 3. Pour the jasmine-infused milk over the sugar/yolk mixture and mix well. 4. Wipe with a very wet cloth and then cover your baking mold (whatever shape is going to fit on the inside your Yule log/cake) with parchment paper. Place it into a large roasting pan then pour hot water into the roasting pan all the way up half way of the baking mold. Pour the cream into the mold and bake at 210°F (100°C) for about 1 ½ hour or until firm on the edges and slightly wobbly in the center.5. Let cool and put in the freezer for at least 1 hour to firm up and facilitate the final assembly. 1. In a mixer, pulse the together the almond meal and the confectioner's sugar for no longer than 30 seconds then sift in the unsweetened cocoa powder. Finely mix all ingredients until incorporated. Note: You will see that a Pate a Bombe is mentioned in this recipe. A Pate a Bombe is a term used for egg yolks beaten with sugar syrup then aerated. It is the base used for many mousse and buttercream recipes. It makes mousses and buttercreams more stable, particularly if they are to be frozen, so that they do not melt as quickly or collapse under the weight of heavier items such as the crème brulee insert. In the Vanilla Mousse variation, pastry cream is made to the same effect. In the Mango Mousse variation, Italian meringue is made to the same effect. Italian meringue is a simple syrup added to egg whites as they are beaten until stiff. It has the same consistency as Swiss meringue (thick and glossy) which we have used before in challenge recipes as a base for buttercream. The whipped Cream option contains no gelatin, so beware of how fast it may melt. 8g powdered gelatin = 1 (0.25 oz) envelope powdered gelatin = 1 Tbsp powdered gelatin = 1 Tbsp Agar-Agar. 1 Tbsp. of agar-agar flakes is equal to 1 tsp. of agar-agar powder. 2. Make a Pate a Bombe: beat the egg yolks until very light in color (approximately 5 minutes until almost white). 3. Cook the sugar, glucose syrup and water on medium heat for approximately 3 minutes (if you have a candy thermometer, the mixture should reach 244°F (118°C). If you do not have a candy thermometer, test the sugar temperature by dipping the tip of a knife into the syrup then into a bowl of ice water, if it forms a soft ball in the water then you have reached the correct temperature.4. Add the sugar syrup to the beaten yolks carefully by pouring it into the mixture in a thin stream while continuing to beat the yolks. You can do this by hand but it’s easier to do this with an electric mixer. Continue beating until cool (approximately 5 minutes). The batter should become thick and foamy.3. In a double boiler or equivalent, heat 2 tablespoons of cream to boiling then add the chopped chocolate and stir until melted and smooth. 5. Pour the melted chocolate over the softened gelatin, mixing well. 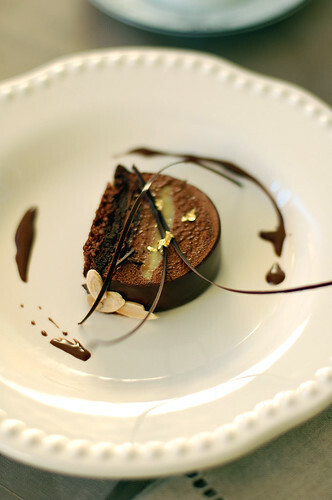 Let the gelatin and chocolate cool slightly and then stir in ½ cup of WHIPPED cream to temper then add the Pate a Bombe. 6. Add in the rest of the WHIPPED cream mixing gently with a spatula until incorporated. 1. Add the jasmine tea leave to the heavy cream and let steep in the fridge overnight. Strain before use. 2. Make a caramel: Using the dry method, melt the sugar by spreading it in an even layer in a small saucepan with high sides. Heat over medium-high heat, watching it carefully as the sugar begins to melt. Never stir the mixture. As the sugar starts to melt, swirl the pan occasionally to allow the sugar to melt evenly. Cook to dark amber color (for most of you that means darker than last month’s challenge). 2. While the sugar is melting, heat the jasmine infused cream until boiling. Pour cream into the caramel and stir thoroughly. Be very careful as it may splatter and boil. Note: Because the icing gelifies quickly, you should make it at the last minute.For other gelatin equivalencies or gelatin to agar-agar equivalencies, look at the notes for the mousse component. THIS IS FOR UNMOLDING FROM UPSIDE DOWN TO RIGHT SIDE UP. You will want to tap your mold gently on the countertop after each time you pipe mousse in to get rid of any air bubbles.1. Line your mold or pan, whatever its shape, with rhodoid (clear hard plastic, I usually use transparencies cut to the desired shape, it’s easier to find than cellulose acetate which is what rhodoid translates to in English) OR plastic film. Rhodoid will give you a smoother shape but you may have a hard time using it depending on the kind of mold you’re using. 2. Cut the Dacquoise into a shape fitting your mold and set it in there. If you are using an actual Yule mold which is in the shape of a half-pipe, you want the Dacquoise to cover the entire half-pipe portion of the mold. 4. Take the crème brulee insert out of the freezer at the last minute and set on top of the mousse. Press down gently to slightly ensconce it in the mousse. 5. Pipe second third of the Mousse component around and on top of the crème brulee Insert. 9. Pipe the Ganache Insert onto the frozen mousse leaving a slight edge so that ganache doesn’t seep out when you set the Dacquoise on top. 10. Close with the last strip of Dacquoise. 1. Pipe one third of the Mousse component into the mold. 2. Take the crème brulee insert out of the freezer at the last minute and set on top of the mousse. Press down gently to slightly ensconce it in the mousse. 3. Pipe second third of the Mousse component around and on top of the crème brulee insert. 4. 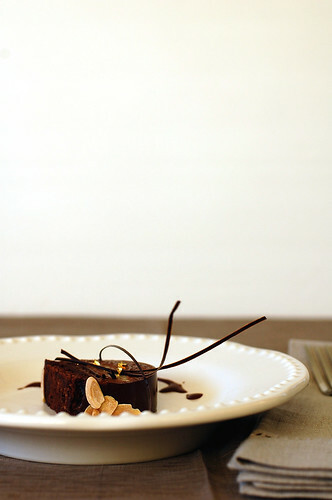 Cut the Praline/Crisp Insert to a size slightly smaller than your mold so that it can be surrounded by mousse. Lay it on top of the mousse you just piped into the mold. 5. Pipe the last third of the Mousse component on top of the Praline Insert. 6. Freeze for a few hours to set. Take out of the freezer. 7. Pipe the Ganache Insert onto the frozen mousse leaving a slight edge so that ganache doesn’t seep out when you set the Dacquoise on top. 8. Close with the Dacquoise. 2. Cover the cake with the icing. 3. Let set. Return to the freezer. 5. Transfer to the refrigerator no longer than ½ hour before serving as it may start to melt quickly depending on the elements you chose. wish it's right in front of me now. My God woman! I am an okay baker but you are a Goddess! The pictures are equally amazing. How long did that take you? I bow before you. Thanks for sharing! I'm just struck by the beauty of your log. Its gorgeous. How did you do those chocolate strands? Mon dieu, voilà des images superbe ! Je suis sans voix ! Vos photos sont...waouw, parfaite c'est le mot, c'est agréable de les regarder et de voir tant de talent ! Vous êtes photographe ? Vos photos sont plus jolies que dans un livre. La bûche est somptueuse, parfaite ! J'ai vu beaucoup de challenge, mais le vôtre est peut être le plus spectaculaire ! C'est la class, même "Le Nôtre" peut aller se rhabiller (ce qui est pas facile car c'est un pâtissier hors paire), mais votre boulot est digne des grand de ce monde ! Bonne fin d'année à vous et bonne future année ! It's simply gorgeous V and the pictures are absolutely stunning. I'm so pleased we gave you something that was up to snuff for you since you are such a talented baker, just let me know if you need a translation of anything else from French to English ;) I hope you have a lovely New Year! An extremely pretty log! Beautiful and perfect! Your pictures are stunning too! This looks so delicious! Your decorating looks really beautiful and professional. The flavors sound amazing! Yum. Very beautiful styling. It looks... perfect! What a sophisticated looking yule log! Love it! are you sure you are not a pastry chef? my god this is icredible...........good job! Just beautiful! I am so behind, due to much traveling, that I still have to post mine, which I hope to do in the next day or so. Your pictures are stunning, and I love the idea of the jasmine infused flavor. This is breath-taking as ever! gorgeous! You have a lovely blog! Ggorgeous! Love the chocolate strand decorations. Thank you everyone for your kind comments! Best wishes to all in 2009! Aparna - Believe or not, the chocolate strands were the easiest to make! 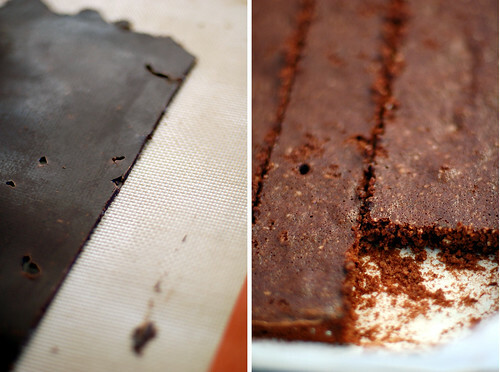 Just temper the chocolate, spread it on a stripe of acetate then draw line using a comb! I think this is the most beautiful one I have seen...and I have seen a lot of them! Congratulations, that is an extremely beautiful log! J'ai également réalisé la recette en version vegan. Pfiouh c'est à devenir jalouse ! the strend is 1 of my fav to use , thats what people say, SIMPLE AND NICE. Your Yule Log is absolutely exquisite! Stunning! I am so glad that you were within 5 blogs either side of mine on the list this month, otherwise I might not have discovered your beautiful blog. Une oeuvre d'art pour les yeux et les papilles!! Thanks so much for all your kind notes! Bria – thank you! At the rate that DB is growing, it is hard to keep up with everyone! Absolutely gorgeous log! And breathtaking photos! Very Happy New Year, Vi! The mold is about 13 3/4""L x 2 3/8""W x 1 3/4""H and about 3 cups capacity.